The Vienna Pass can be collected from the Vienna PASS Customer Service Centre (by the State Opera Underground Station). The Customer Service Center is open Monday - Saturday: 10:00 - 17:00, Sundays and Holidays: 10:00 - 15:00. The pass is available all year round. We are comparing Vienna PASS: City Sightseeing Vienna Attractions Prices from leading ticket suppliers and Try to find you Cheap tickets prices on the market. Vienna is home to some of Europe's most talked about museums and attractions and is bursting with culture, history and sophistication. The best way to fit all of the city into your trip is by making use of the Vienna PASS and enjoying free access to the cities best attractions. Don't forget to make use of the unlimited bus rides (on the hop-on-hop-off bus) that comes with the Vienna Pass. The bus routes make touring the city, and reaching the attractions, super easy. Visit the cities most popular attractions including Schönbrunn Palace, Hofburg Palace, St.Stephen's Cathedral and Belvedere Palace. History buffs can visit the Kunsthistorisches Museum, the Museum of Modern Art and the Museum of Natural History all in one day. Families can use the pass to create a day out to remember by visiting Schönbrunn Zoo, Vienna's Giant Ferris Wheel and Madame Tussauds. Perfect for those wanting to pack their time in the city with lots of attractions. Your Experience With Vienna PASS: City Sightseeing Vienna Attractions? The Vienna PASS offers free admission to over 60 of Vienna's top attractions. Make use of the unlimited hop-on-hop-off bus routes to travel around the city and take in the sights. Skip the line at many attractions including the Museum of Natural History, Museum of Technology, Schönbrunn Zoo and Vienna's Giant Ferris Wheel and lots more attractions. Use your pass for your chosen amount of days seeing as many cultural, historical and educational sights as possible. What Vienna PASS: City Sightseeing Vienna Attractions Includes? Free admission to lots of the cities main attractions. Skip-the-queue entry to most attractions. Doesn't include public transport Travelcard (can be booked as an optional extra). Doesn't include card delivery via mail. Unbiased comparison of Vienna's Tourist Attractions Skip-line Passes(Vienna City Card vs Vienna Pass) based extensive research, Tripindicator team came up with comprehensive recommendations which helps you choosing Best Vienna City Attractions Skip-line Pass suitable for your travel. Unbiased comparison of Vienna's Sightseeing Bus Tours operators(Big Bus Tour Vienna vs Vienna Hop-On Hop-Off Bus + Boat vs Vienna Hop on Hop off) based extensive research, Tripindicator team came up with comprehensive recommendations about Vienna sightseeing tours which helps you choosing Best Vienna Sightseeing Hop-on Hop-off Tour suitable for your travel. Make sure you pick your pass up for it to be valid. You can't use your electronic or paper ticket to enter the attractions. Pick up your Vienna pass at the Vienna PASS Customer Service Centre (by the Vienna State Opera). Travelers Reviews about Vienna PASS: City Sightseeing Vienna Attractions? 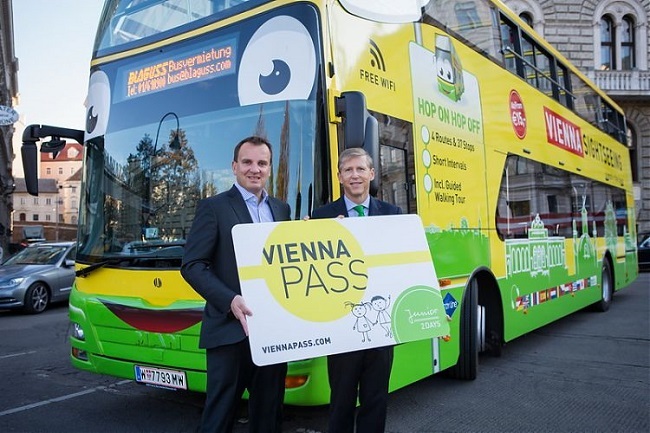 The Vienna PASS is rated 4.5 stars on Tripadvisor with most customers agreeing that the pass is “worth your money” and “useful for visiting multiple attractions”. Customers also stated that purchasing the pass online in advance was efficient and collecting the pass in Vienna was easy. Wheelchair users should seek information regarding access from each individual attraction. Most do have wheelchair access. Tickets are fully refundable up to 24 hours in advance if your ticket was purchased from Get Your Guide, or up to 7 days in advance, if your ticket was purchased from Viator. Tickets must be printed out to trade in for your pass. Mobile tickets are not accepted unless you've booked through Tiquets. Each attraction can only be entered once with the pass, you can't return a different day with it. Hop-on-hop-off bus rides are, however, unlimited. Passes should be collected from he Vienna Pass Customer Service Centre, Vienna 1010 (located close to the State Opera underground station).